Case Studies from the Middle Kingdom Dr. Keith Erlandson, Director of Veterinary Services, Swine Lines, for the CP Group China, shares his perspective on What Chinese Vets Think You Should Know. Dr. Erlandson shares his personal views of how pork production in China is evolving. Key takeaways: In China, hiring good employees is hard, building efficient systems for the good of the farm is difficult, and the study of production veterinary practice is not as well developed as in the USA [video]. Case Studies from the Middle Kingdom - Dr. Keith Erlandson, from the 2017 Allen D. Leman Swine Conference, September 16-19, 2017, St. Paul, Minnesota, USA. Pathogenesis and control of Chinese highly pathogenic Porcine Reproductive & Respiratory Syndrome (PRRSV) - Dr. Hanchun Yang, China Agricultural University, from the 2016 North American PRRS Symposium, December 3‐4, 2016, Chicago, Illinois, USA. U.S. Exports & International Trade - Becca Nepple, National Pork Board and Dr. Dermot Hayes, Iowa State University, from the 2016 World Pork Expo, June 8 - 10, 2016, Des Moines, IA, USA. 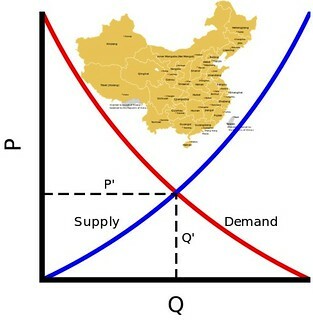 Slowing of China's Economy Impacts to Pork China's export based economy is trying to make the transition to a Chinese consumer based economy. Impacting China is the drought and their need to import corn and soybean to feed their 400 million pigs. This NPR episode shares some insight on the Chinese economy and what pork and crop producers in the US should consider [audio]. China's economic boom has altered the global economy but its growth is slowing down. Steve Inskeep talks to Beijing-based economist Patrick Chovanec about China's economic troubles, and how that affects the U.S. economy. Cities and Swine Seemingly everywhere one looks China offers two views of today. 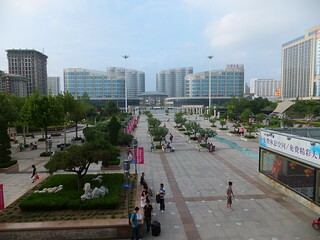 Outside the Weifang train station, open spaces and modern, even futuristic buildings give the appearance of a prosperous nation ready to lead on the world stage. In truth, many of the offices and apartments we observed were empty. The leaders use construction to employ the people on the assumption that it's cheaper to build today than it will be tomorrow. Inside these buildings are cement walls and roughed in plumbing. Around the corner you see workers on a bamboo raft clearing algae from a retention pond, using technology of decades past. My recent China sojourn, with JBS-United, was a reminder of the massive changes our North American swine industry has embraced. Internal issues (genetics, disease, feed quality) and external issues (feed costs, blasted hot weather, immigration) have been dealt with and cataloged for future "black swan" events. The overwhelming sense of purpose, unity, vast resources that I viewed as we traveled is offset by flexibility, adaptability, hygiene and husbandry here at home. It's easy to be awed by the China machine but we have the lead and the know-how to maintain it [Editor note: text and photo Ned Arthur, SwineCast].